Venous Support contains clinically-proven botanical and flavonoid combinations to support the connective tissue integrity of veins and capillaries. Optimal function of the venous circulatory system is essential for controlling fluid balance within the tissues of the upper and lower extremities, and to maintain normal volume of the leg and hemorrhoidal veins. 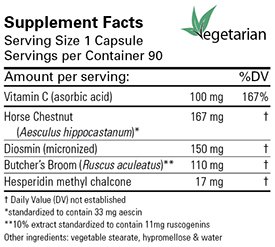 Horse Chestnut Seed Extract contains escin, and Butcher's Broom contains ruscogenins; these saponins are responsible for effects on vascular tone and permeability. The flavonoids diosmin and hesperidin, often combined with vitamin C, also have important influences on vascular connective tissue. Placebo-controlled trials have demonstrated the effectiveness of horse chestnut seed extract in alleviating the objective signs and subjective symptoms of impaired venous function (Int Angiol 2002;21:305-15; Cochrane Database Syst Rev 2012;11:CD003230). In a case observation study involving 800 general practitioners and over 5,000 patients, horse chestnut extract produced dramatic improvement or complete relief of all symptoms of impaired venous function (Fortschr Med 1996;114:196-200). Randomized, controlled studies have shown that horse chestnut seed extract reduces symptoms of impaired hemorrhoidal vein integrity (Clin Ter 1978;86:545-59). 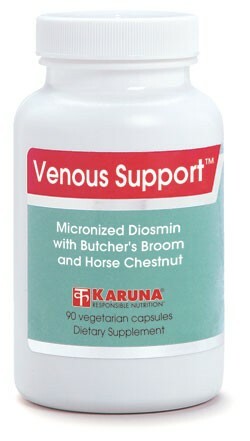 Oral diosmin, a flavonoid, improves venous tone, vein elasticity, and other signs and symptoms in impaired venous function; the compound also accelerates leg ulcer healing (J Vasc Res 1999;36 Suppl 1:37-41). The combination of butcher's broom (Ruscus aculeatus), hesperidin and ascorbic acid has been shown in a randomized multicenter study to be superior to another leading vasoactive medication in the treatment of impaired venous lymphatic function (Int Angiol 2003;22:250-62). Suggested use for adults: One capsule three times daily, away from meals, or as directed.